Blondie and Brownie: I Want to Eat All The Brick Chickens! After Sandy, I couldn't really go far from my neighborhood. 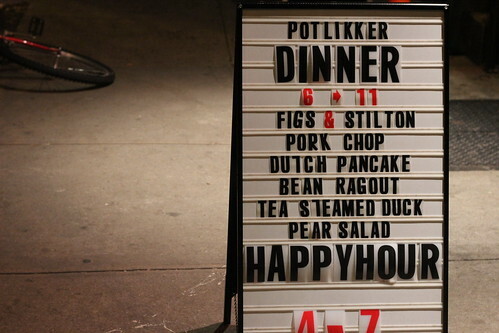 This meant finally trying out a few spots I'd been meaning to get to, like Potlikker in South Williamsburg. The restaurant comes from Liza Queen, of the former Queen's Hideaway, a place I'd never made it to. It's Southern-inspired and I had heard about their brick chicken. Brick chicken literally involves cooking a chicken under a brick which, when done right, makes the skin extra crispy and the meat succulent and juicy. And it is done *right* at Potlikker. 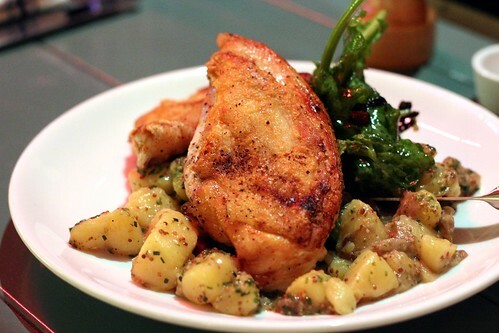 The two breasts are perfectly cooked and you will find yourself eating both, savoring every crispy bite of skin along the way. Right now, the chicken comes atop German potato salad, that would have been great if I loved mustard. Now, I just have to find the time get back to try their Dutch pancakes!